I just wanted to do a quick review of my latest nail polish purchase. I have written about this brand of nail polish before and you can view that review here. This is an aussie brand of nail polish that contains no nasties and comes in a gorgeous range of colours. 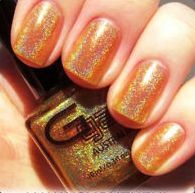 You can find out more about Glitter Gal on their website here. They have some really beautiful duo-chromes, transitionals, opals etc..... and they are available internationally. The photo above is of my nails with inside light. I just wanted to give a contrast of how the polish appears different depending on the lighting. The above photo show how you can also add a layer of Glitter Gal over another shade to brighten it up. I love the formula of these nail polishes. They apply smoothly, nice thin coats, quick drying time, no mess and a good brush makes application easy for someone as inept at painting her nails as I am. I can't tell you the number of times I have applied nail polish and then stuffed it up and had to start ALL over!! I just can't get it right sometimes. Two coats is all you need for a gorgeous depth of 3D colour, this would have to be one of my favourite nail polishes right now. WOW... I'd get so distracted at work/school if i wore this polish. so pretty.